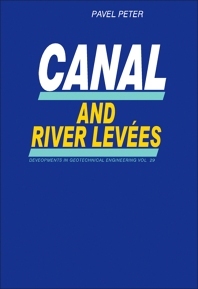 Canal and River Levées covers the fundamental principles of canal embankments and levées calculation and design. Canal embankments and levées are amongst the world's oldest hydroengineering structures. This book is divided into seven chapters that focus on solving the problems of protecting control levees, which sometimes called anti-flood or anti-inundation dykes. The opening chapter surveys the general problems of dam design and construction. The next chapters deal with the basic characteristics, determination, experimental methods, and calculations of seepage, as well as the stability calculations and embankment settlement. These topics are followed by discussions of the local conditions and demands relating to the construction of embankments and their various concrete structures. Other chapters explore the requirements of power- and irrigation-canal sealing and the subsoil protection of levees. The last chapter looks into the measurements, general requirements, and observation of dams and levees. This book is intended primarily for civil engineering designers.